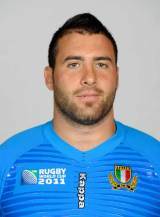 Canadian born flanker Barbieri started two of Italy's five games during the 2011 Six Nations. Having started his career playing for Yeomen in Canada - Barbieri opted to move to Italy and joined Overmach Parma before making the switch to Treviso. His brother - Michael - opted to play for Canada over Italy. Robert will hope to make amends for missing the 2007 World Cup through injury by staying fit for the 2011 showpiece. He has been named in Nick Mallett's 30-man squad for the tournament.